Graham Bonnet is one of the UK’s hardest working rock vocalists. In the past, he’s fronted big name bands, been a voice for hire for several widdly guitarists and even found time in between for a hit and miss solo career. When on good form, Bonnet can be terrific (as evidenced on Rainbow’s classic ‘Down To Earth and his own ‘Line Up); when he misses the mark, he has the ability to do so in a devastating way (the Blackthorn debut is pretty nasty, and somehow his solo LP ‘No Bad Habits’ from 1978 ended up being one of the worst albums ever recorded). Despite these inconsistencies, the Skegness born singer has reached legendary status. Given how bad Bonnet sounded on most of Blackthorne’s 1993 album ‘Afterlife’ and Impelliteri’s ‘System X’ (released almost a decade later), it’s probably fair to say that Bonnet’s post 80s work could be approached with some trepidation, but (almost) throughout ‘The Book’s eleven previously unheard tracks he’s in good voice – very good voice in fact – with his sometimes slightly ragged approach helped no end by the sympathetic musicians in the Bonnet Band. Backed by these strong players – often favouring a fairly bombastic bent – Graham turns in some of his best performances since Impelliteri’s ‘Stand In Line’, all the way back in ’88. Giving the whole of the Bonnet Band a maximum workout, the opening number ‘Into The Night’ hits hard with a distinctly Euro bent. With thunderous riffs that combine the best of Malmsteen and Impelliteri, it’s full speed ahead for guitarist Conrado Pesinato and drummer Mark Zonder as everyone tackles an old fashioned metal tune with maximum sweatiness. Pushing the hard edge of his voice, Bonnet sounds much better here than he has on similar material in the past, but the cheese factor is high and the Malmsteen-ish, Escape Music preferred sounds make this an average opening statement. From there on, things improve and in thankfully very quick time. ‘Welcome To My Home’ slows the pace and stokes up the keyboards along with a pleasing melodic riff. On this more AOR-centric track, the cleaner side of Pesinato’s playing takes pride of place and with more room for vocal manoeuvre, Bonnet shows how his voice is comparable to that of his younger self. There’s an element of grandeur in the chorus, echoing elements of Rainbow and Alcatrazz, but it’s still a thrill to hear Graham throwing himself at this kind of material with the minimum of fuss. With regard to that main hook, there’s a thoughtful selection of backing vocals fleshing everything out; the chuggy guitar riff bolsters an already good melody and Jimmy Waldo (ex-Blackthorne) adds a busy keyboard melody. This is very good, no question, but it pales in comparison to ‘Rider’. As this album’s most AOR inspired cut, the huge twin leads are an instant classic in terms of melody and appeal while, as before, Bonnet really shines. Although newly written it has massive echoes of the past, especially with regard to the chorus which is a dead ringer for a couple of tracks from the ‘Line Up‘ era. For those doubting that Bonnet whether Bonnet could record anything in the autumn of his career worthy of standing alongside his early work, this tune is set to silence the naysayers. It’s superb. Moving back into the faster paced style, ‘Dead Man Walking’ rumbles with the heart of Impelliteri circa 1988 but does a much smarter job. It’s a number that truly flexes the musical muscle within the Bonnet Band – particularly those of Zonder and Waldo, adding meaty beats and organ swirls throughout, while Graham rouses everything with a huge – but thankfully not too huge – performance. Chorus wise, it’s memorable enough, though perhaps since we’ve already been spoilt somewhat by ‘Rider’ by this point, it definitely takes a few more plays to sink in. Of particular interest during this number is the way wordless backing vocals beef up the chorus and surrounding bars with a classy air, while Pesinato’s featured solo is also rather fine. He fills various bars in a way that strikes the perfect balance between the melodic and showy, with plenty of sweeping notes. This solo really demonstrates why he was given the role within the Bonnet Band. He is a player with a broad scope, capable of soft and melodic as well as nimble and sharp – just the talents needed should a Ritchie Blackmore composition or three be part of a night’s work. ‘Strangest Day’, neanwhile, is workmanlike fare that wouldn’t be out of place on an Alcatrazz LP. Everyone turns in good performances, but the levels of 80s bombast ensure this is only a mid-table effort if pure melody is your stronger desire, but it might just be a classic if placed in direct competition with ‘Earth’s Child’, a hugely bloated and stodgy melodic metal fest that sounds like Impelliteri jamming with a third rate Rainbow obsessed band from Europe. While the music has more appeal than ‘Into The Night’, Bonnet overcompensates for the slower pace by belting his lungs as often as possible. The results are neither that interesting or tuneful; it’s ‘The Book’s only genuinely bad chapter. The tracks which fill the rest of the first disc are fine fare, with the slow and spacious ‘The Dance’ being a particular highlight. Taking the slower pace, bassist Beth-Ami Heavenstone locks into a solid groove with Zonder which then allows Waldo to lay down a blanket of keys. By the time the slow and chugging guitar riff takes hold, there’s more than a feel of Bonnet’s more AOR solo works at play, as well as a smidgeon of Rainbow (though, perversely, has far more in common with some of the Joe Lynn Turner fronted material than Bonnet’s own). The inclusion of another smart guitar solo really cements this track’s place as one of the best. The much more ominous tones of ‘Where Were You’, presenting an edgier verse dominated by dark synths, gives a superb contrast to the previous track almost immediately, as well as a separate contrast between verse and chorus within it’s own four minutes. While the verses promise something a little different to what’s gone before, the chorus reverts to roaring Euro hard rock, only this time it’s tackled far better than on any of the other pacey tracks. Pesinaro, in particular, sounds unnervingly comfortable while Bonnet belts his way with ease…and with the kind of passion present within a performer of half his age. The title track, meanwhile, is fist-pumping hard rock that flaunts Bonnet’s Rainbow associations with glee, especially as Waldo plays hard at the B-3 and a couple of the chord changes hint at works like ‘Lost In Hollywood’. The result is something you’ll feel you know instantly (though still sounds superb), while ‘Everybody Has To Go There’ brings chunky melodic rock that showcases Zonder’s drumming at first, before shifting the focus towards bass and guitar. It’s a case of good tune and not a lot else: there are times where Bonnet sounds as if he’s singing a different song. The chorus – an odd refrain with neo-theatrical vocals – sounds like an interesting idea not quite thought through, mixing hard rock with pomp and a very 70s edge. It’s not a dead loss – another superb solo from Pesinato almost rescues this completely – but it’s rather unsettling and also seems to end abruptly, as if even the band are unsure where it was going. Thankfully, set closer ‘California Air’ ends things on a high with a barrage of stabbing AOR keys and an effortless riff, coupled with a decent chorus and top-notch vocal. Again, there’s a feeling of familiarity, especially for those who love the ‘Line Up’ period; in short, it’s the kind of track that appears sporadically throughout Bonnet’s career – and the kind of track that always makes it so much easier to forgive his musical missteps. Disc two adds a further sixteen tracks, highlights from Bonnet’s career from 1979-1991, all re-recorded with the Bonnet Band anew. Revisiting and re-recording material is always a tricky concept: the old songs are beloved by fans and – perhaps a great live performance aside – nothing beats the originals. Thankfully, though, the results captured here for posterity are surprisingly good…and even at their weakest, there’s honestly nothing as terrible as the version of ‘All Night Long’ from the first Blackthorne LP. The re-visitation of the past begins with four interpretations of songs from Rainbow’s classic ‘Down To Earth‘ album. Arguably Graham’s finest forty minutes, a strong case could be made for it being the best Rainbow album, too – even taking ‘Rainbow Rising’ into consideration. If these tracks had been ruined, there would be some fans baying for blood. Luckily, they can rest easy. Perhaps the biggest surprise comes first as everyone launches into the near-peerless ‘Eyes of the World’. Angelo Vafeiadis steps in for Jimmy Waldo and while his keyboard work doesn’t quite have the presence of Don Airey, he tries his best to impress. Pesinato has the unenviable job of tackling Ritchie Blackmore’s guitar parts, but comes away from the track with complete dignity, having played some great chops. There are nods to Blackmore in the early part of the solo with the soaring notes, but he makes a lot of the track his own without losing too much of the feel of the original. Bonnet, meanwhile, is in terrific form – his voice barely distinguishable from his younger self. ‘All Night Long’ follows in a slightly meatier arrangement, allowing for pumping bass and big backing vocals, as the band sound like they’re having a good time ploughing through the Rainbow hit. There’s nothing unexpected, nothing flashy, but that’s the key in its strength. It’s utterly respectful; maybe now we can finally forgive Bonnet for that Blackthorne abomination twenty five years earlier… Not quite up to the same standard, ‘Lost In Hollywood’ occasionally exposes an odd wobble in the vocal department with a touch of over-singing, but musically everyone is tough and tight throughout. Graham improves somewhat during the end section and by the time everyone’s done it’s been decent enough, before a take on that old chestnut ‘Since You’ve Been Gone’ comes across as a little by-numbers – not as good as the Rainbow take, but a thousand times better than Impelliteri’s – but very much a handy reminder of how an evergreen rock tune should sound. Of most importance here is guitarist Pesinato who turns in a great solo without any temptation to try and recreate the Blackmore take. ‘Night Games’ remains a brilliant AOR tune and with a fuller production sound than afforded in 1981 (on Bonnet’s ‘Line Up’ LP) certainly manages to be one of the best re-recordings. An example of the Bonnet Band working together to bring an extra chunkiness to proceedings, presenting themselves as a great hard rock band in their own right, the hard rock chug and tempering twin leads on this track rarely sounded better. ‘S.O.S.’, with its odd morse keyboards and quirks was always one of ‘Line-Up’s weaker tracks, but – much like ‘Night Games’ – with a slightly dirtier guitar tone and heavier approach comes across as a solid hard rocker. Graham is in good voice, but perhaps not as flawless as on ‘Eyes of the World’. If these tracks re-inspire a listen to the ‘Line Up’ LP (reissued on CD in 2016 after spending years in an out of print limbo), then it’s been more than worthwhile. From here, things aren’t quite as enjoyable, at least for a time. This has nothing to do with the new performances, but more to do with the material in hand. Let’s face it, the Michael Schenker Group album really pales in direct comparison with Rainbow. However, the three re-workings from the Michael Schenker era allow the bend to heavy things up, with a pleasingly tough guitar sound throughout ‘Assault Attack’, a performance also allowing Bonnet to unleash a slightly growlier style while simultaneously introducing an occasionally hefty bass rattle from Heavenstone. The same applies to ‘Dancer’; it’s respectful to the MSG cut and the band sounds very good indeed, with some pleasing chorus vocals. ‘Desert Song’, however, remains half-forgettable stodgy rock fare, both in 1982 and 2016. That said, as with ‘Assault Attack’, it’s hard to find fault with the Bonnet Band’s reinterpretation of it and the two melodic solos are still very much the highlight of what feels like an overlong six minutes. Moving into the Alcatrazz years, things instantly take a lift on ‘Island In The Sun’ thanks to various 80s keyboards (reproduced faithfully in 2016) and some superb bass work. As the shiny keys weave in and out of the bass, Bonnet sings his heart out and when joined by pompy backing vocals, he loses none of his presence. This is so 80s – so shamelessly 80s, in fact – there are moments where you’d question when it was recorded, so that alone makes it a good re-recording. Pestinato sounds inspired and in all, it’s a great listen, worth an ear if you still love the original cut. No amount of tweaking, re-imagining or re-recording could make ‘Hiroshima Mon Amour’ listenable in the first place, so the least said, the better…and then comes one of the set highlights, ‘God Blessed Video’. The Bonnet Band attack this tune with all of the necessary gusto – working those vocals and drums to the max. The high notes aren’t quite as high as those thirty years prior, but most of what you loved about this bonkers, high speed melodic metal workout is intact. It’s a brave man who attempts to replay a Steve Vai guitar part, so Pestinato wisely just opts to do his own thing, but does a fine job with the tapped rhythms between the vocals. If anything on this disc could’ve fallen on its arse, this was it… A job well done by all. ‘Will You Be Home Tonight’ still has odd vocal phrasing that sounds like it comes from a Rodgers and Hammerstein musical in places and the vocal is an odd fit with the very structured music. Bonnet’s more gravelly style hampers things in places and the band kind of go through the motions without adding any real flourishes of their own, but…it’s okay. The last of the Alcatrazz tunes, ‘The Witchwood’, allows for some great melodic guitar work and shows Heavenstone to be a very methodical bassist. It’s a case of good music occasionally being spoilt by an overblown vocal, but then then original cut from 1986 wasn’t ever the best song in the world either and at least this benefits from a better production. Rounding out this retrospective of re-recordings are a couple of lesser known tunes. ‘Stand In Line’ represents the only acknowledgement to either of Bonnet’s stints with Impelliteri and is utterly faithful bringing lots of Malmsteen-ish shredded riffs and a bellowing vocal and ‘Here Comes The Night’ (originally from the 1991 solo album of the same name) presents the Bonnet Band with a chunky, Euro hard rock sound. It’s a spot-on reworking with a strong vocal; while not as impressive as a couple of those Rainbow cuts, thankfully it closes this set with something very enjoyable. The shredding guitar solo and a world of heavy keys provide listening highlights and prove that re-recording stuff isn’t always (a) a vanity project or (b) sheer waste of time. 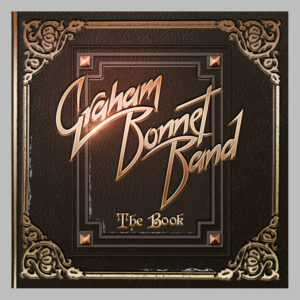 It’s hugely unsurprising that there’s nothing included from ‘Graham Bonnet’ (1977) and ‘No Bad Habits’ (1978), but all the same, it might have been cool to hear Graham dropping in a couple of unexpected tunes from the past instead of just re-working the classics. It’s unlikely these recordings are likely to replace the originals in your affections, but that kind of goes without saying. It’s a pleasure to hear re-recordings of such a high calibre, though, and as such, this second disc makes a very welcome bonus. For Bonnet’s legion of fans, both discs of ‘The Book’ feature more than enough highlights to guarantee listening entertainment. At least half of the newly written tracks could stand up among his very best, especially the bombastic ‘Where Where You’ and the exceptional ‘Line Up’-esque AOR tones of ‘Rider’. Granted, re-recording the classics can often end in disappointment but even most of those pass muster, too, showcasing the guitar work of Pesinato admirably enough. With the old meeting the new on fairly equal terms and parts of the first disc exceeding expectations by some distance, ‘The Book’ is surprisingly good. As an anthology of Bonnet’s position in rock circa 2016, this two disc set does a fine job in reminding the world how commanding a performer he can be when teamed with the right musicians. This entry was posted in Album & EP Reviews and tagged alcatrazz, blackthorn, classic rock, frontiers records, graham bonnet, hard rock, impelliteri, rainbow by Real Gone. Bookmark the permalink.